August | 2012 | E-verything! Again a Serendipity session where we didn’t vote on a topic! When we are only very small group as has been the case often lately it works well for us to briefly visit several topics. This week we looked a “reading to dogs”, “why great programs/apps close” and 2stC expectations in a digital age. As always we recorded the session. We then moved on to consider some possible reasons why what we feel are great programs/apps disappear or are changed beyond recognition by being taken over. An offshoot from this included thoughts on the proliferation of new apps many of which seem to be very similar in purpose and which often don’t last long. My own leanings are towards using Open Source apps maintained by the community. This is because it appears to me that anything small and commercial that is good is immeditely a target for takeover by one of the giants in the field. It is then either shut down because it was a competitor or changed beyond recognition in the name of re-badging. These closures of good apps also raise issues about loss of personal data that has been uploaded and/or the complexities of removing it and transferring to a new platform. This provides a strong argument for having everything backed up in the “down here” and not just up in the cloud. Our final very briefly visited topic was about the continuing existence of 20th Century expectations/methodologies being applied to assessment of learners who are learning using digital technology. This raised questions about: the time spent teaching the students how to use the tech tools instead of working with content; and the fact that students no longer need to learn and regurgitate content but must instead be able to evaluate information that they source from the Internet and make informed judgements on its reliability. This is definitely a topic for a full Finefocus session in the future! As always a fascinating session – we almost forgot to stop at the finish time! These flying visits to several topics in a session are fun, and they work well with a small group. Our next Webinar is an Edublogs “Fine Focus” session. In this session Phil Hart (@philhart) will take us on an introductory look at e-publishing in “E-publish or be e-damned”. Join us on Thursday August 23rd at 23:00 GMT/UTC the time for you will vary depending on your timezone (check yours here) Thursday afternoon/evening in the USA, late night Thursday in Europe, and Friday morning August 24th in Australia – in the usual Blackboard Collaborate virtual room. This is the overview for our most recent (recorded as always) FineFocus webinar with guest presenter Lisa Conrad (@ljconrad).Lisa gave us a fascinating look at the Twitter (Gifted and Talented) #gtchat from its inception to the current position and on into the future. She also gave us opportunities for and answers to many questions! 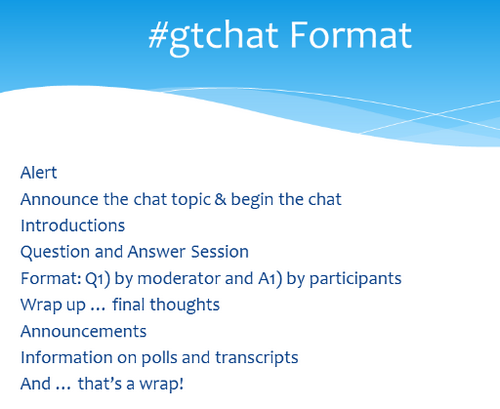 Lisa began with an explanation of #gtchat and a poll to find out our awareness of #chats in general on Twitter. Then she talked about the origins and history of #gtchat from its foundation by Deborah Mersino the first moderator, through the transition to Lisa herself as moderator, and also the support from the Texas Association for the Gifted & Talented. Next Lisa gave us a run through on joining Twitter and also: ideas on finding relevant people to follow; suggestions on setting up a Twitter client for #chats; and some explanations of Twitter jargon. With a look at how topics are determined by Poll. This led into a look at some recent topics, and some recent guests. Lisa then moved on to the future, starting with upcoming events and then moving into the future with exciting ideas for future developments in other social media to enhance the undoubted value of #gtchat as a professional development opportunity. This concluded the formal part of the session and we moved on to a great question and answer session where Lisa did a terrific job in responding to many questions. This was a great session! Lisa gave us a fascinating insight into the “inner workings” of #gtchat and much food for thought and inspiration through the potential future developments that will add another layer of “richness” to #gtchat. Thank you Lisa for such an interesting session! As has been the case a couple of times recently this was a Serendipity session where we didn’t vote on a topic! 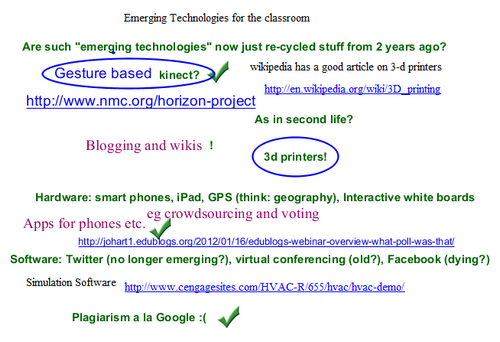 The consensus was to take a quick look at all three that were proposed – “Emerging technologies for the classroom”, “Introduction to PLNs” and “rscon4” The last of these is a little cryptic. It refers to the Reform Symposium Conference for which a date has not yet been finalised. The hashtag seems likely to be #rscon4. The session was, as always, recorded. A lively session with much sharing on the whiteboard and in text chat, although I felt – as so often that I talked too much! We began with a whiteboard of ideas about emerging technologies. Then shared our knowledge of those we had any experience with – my particular fascination out of this part of the session was with the concept of 3D printers. Something completely new to me & definitely out of the realms of science fiction! This was the longest part of the session. Our next topic was “Introduction to PLNs”. Again we used a whiteboard to share our thoughts on the variety of tools and strategies we use as part of our own individual PLNs. Any discussion about PLNs is always worthwhile because there are always new thoughts and angles on how we each view them. This was a “flying visit” to the world of the PLN but sufficient to give a flavour! 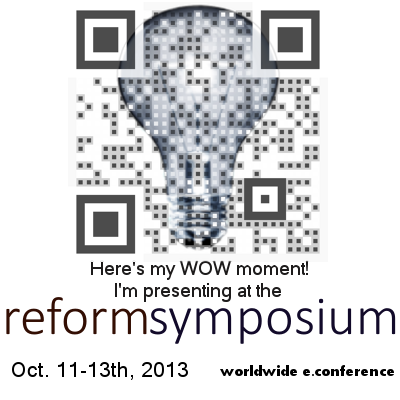 Finally another “flying visit” this time to “#rscon4” this is actually the probable #tag for this year’s (or maybe early next year’s) – the date is yet to be finalised – Reform Symposium Conference. This was a very short chat as the planning for rscon4 is still in the early stages. However it seems it will be a very exciting event using multiple strands and platforms. This was a great session – I always find something new and interesting to me personally in every session. However some stand out more than others and 3D printers are a definite standout for me. The whole idea is getting so close to Star Trek “replicators” that I can almost hope for “transporter beams” to enable me to travel without the claustrophobic “tin tube” experience of flying! Our next Webinar is an Edublogs “Fine Focus” session. This week Lisa Conrad (@ljconrad) – the Moderator of the lively Twitterchat for Gifted and Talented (#gtchat) will give us a “heads up” on #gtchat and on moderating a #chat. Join us on Thursday August 9th at 23:00 GMT/UTC the time for you will vary depending on your timezone (check yours here) Thursday afternoon/evening in the USA, late night Thursday in Europe, and Friday morning August 10th in Australia – in the usual Blackboard Collaborate virtual room.